China, Russia militarizing space to challenge U.S.
Foreign adversaries "are integrating advanced space and counterspace technologies into warfighting strategies to challenge U.S. superiority and position themselves as space powers," states. achieve a range of damaging effects," the report said. China's ASAT missiles include several types with different ranges. The SC-19, a variant of the HQ-19 surface-to-air missile, was used in flight tests in 2007 and 2010. In 2013, China flight tested a new ASAT missile called the DN-2. In February, China flight tested a more capable DN-3, that was also tested in 2017, 2016, and 2015. The ASAT missile training followed congressional testimony in February from Director of National Intelligence Daniel Coats who said China's destructive anti-satellite weaponry would probably "reach initial operational capability in the next few years." Coats also mentioned China had formed military units that carried out "initial operational training" with ground-launched ASAT missiles. Rick Fisher, a China military expert, said the 25-page NASIC report, "Competing In Space," is important U.S. government confirmation that the PLA has progressed from a demonstrated ASAT weapon in January 2007, to multiple units equipped with ASAT missiles. "While the PLA now has actual units of ASAT weapons targeting critical American military and civilian space assets, the United States does not have a similar organized counter-space capability," he said. "We are basically disarmed in the face of an active Chinese military-space capability." "America and its allies are very fortunate that President Trump has decided that the U.S. military requires a new Space Force," he said. "This is not an offensive or destabilizing initiative; it is now a necessary and defensive capability that is urgently required by the United States." "PLA writings emphasize the necessity of ‘destroying, damaging, and interfering with the enemy’s reconnaissance … and communications satellites,' suggesting that such systems, as well as navigation and early warning satellites, could be among the targets of attacks designed to ‘blind and deafen the enemy,'" the DIA report said. Additionally, the report said the number of space satellites is growing rapidly from 100 several years ago to 300 today, making the domain congested and increasing the risk of collisions. Both China and Russia are developing new space arms to achieve military goals. At the same time, Beijing and Moscow are promoting a ban on space weapons in an apparent bid to slow or prevent the United States from matching their space warfare systems. "Despite publicly insisting that space is a peaceful domain, these competitors are in continuing development of several anti-satellite weapons," the report said. China and Russia remain the most capable space warfare states but other nations also are expected to join the space arms race by building system to wage war against American satellites. Russia's new ASAT was not identified. Other officials have identified it as the Nudol, suspected in a flight test in September. "Through military reforms, China and Russia have organized new military forces devoted to the employment of space and counterspace capabilities and regularly integrate them into military exercises." Counterspace is the military's term for space warfare operations and weaponry. Anti-U.S. governments in both China and Russia "continue to develop, test, and proliferate sophisticated anti-satellite weapons to hold U.S. and allied space assets at risk," the report said. "Reversible effects include temporarily blinding optical sensors," the report said. "Non-reversible effects include permanently damaging or destroying sensors or other satellite components. Both China and Russia intend to field counterspace directed-energy weapons." The Pentagon was building its own anti-missile airborne laser inside a Boeing-747 but the program was canceled by the Obama administration. Reduced launch costs and proliferation of space systems will drive more countries to integrate space weapons into their militaries, the report warned. Terrorists also could use space to support attacks using intelligence, communications, and navigation space systems. Among the emerging space-based anti-satellite threats the report identified a variety of arms. They include space-based interceptors to crash into satellites, complex space robots capable of grabbing or crushing satellites by maneuvering close by, and jammers, lasers, chemical sprayers, and microwave weapons. Some states are developing sophisticated orbiting technologies for satellite maintenance and debris removal that could also be used to damage satellites covertly. 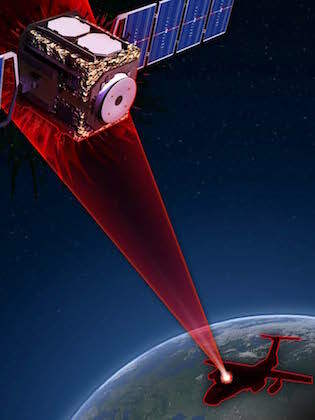 To support both military and civilian use of space, China has a fleet of 120 remote sensing and reconnaissance satellites, half operated by the People's Liberation Army. The satellites allow the PLA to spy on regional rivals like India and Japan and flashpoints in Korea, Taiwan, and the East and South China Sea. For communications, China is developing satellite systems for communications, including the world's first quantum communications satellite, with three others planned. Quantum communications are hardened against jamming or interception. Both China and Russia also deployed navigation satellites to reduce reliance on the American Global Positioning System. The satellites are used for guiding precision weapons. In 2017, Beijing began orbiting a next-generation BeiDou constellation of navigation satellites that offers text messaging and user tracking that "enable mass communications for specific BeiDou users and provide additional command and control capabilities for the Chinese military," the report said. Russia also is maintaining and upgrading its fleet of GLONASS navigation satellites. These alternatives to GPS could allow China and Russia to destroy GPS satellites during a future crisis or conflict, in what the report called "space denial." The loss of GPS would impact police, firefighters, and paramedics and prevent rapid response to emergencies; news, long-distance telephone, satellite television, and internet service also would be unavailable. Retail stores and gas stations would be unable to communicate with banks to handle purchases and critical services "could be affected by weapons targeting our space services," the report said. On space attacks, the report warned that a number of adversaries are building and proliferating a number of types of weapon that can disrupt or deny space services. China and Russia are using orbiting robot satellites that conduct sophisticated maneuvering near other satellites as part of space warfare capabilities. 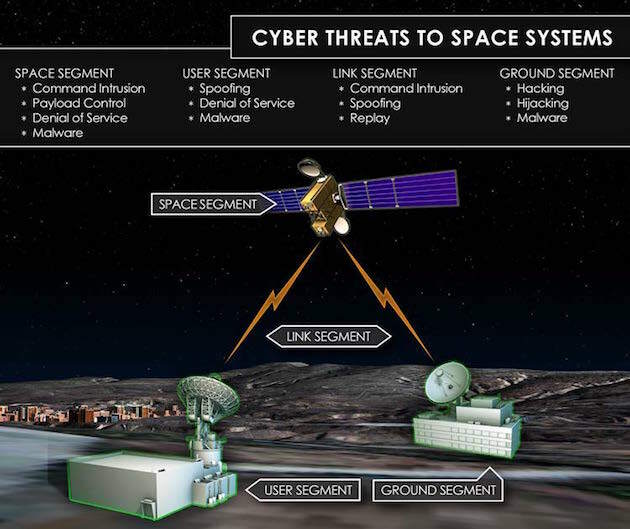 Adversaries plan to conduct physical attacks on satellite ground stations and infrastructure supporting space operations. Cyber attacks also can be carried out against satellites and support infrastructure. The networks used to direct satellites and distribute their data are vulnerable to cyber attacks and electronic jamming can be used to disrupt both uplink and downlink signals. Uplink jamming is aimed at signals going up to a satellite and must operate at the same radio frequency while downlink jamming targets blocking signals coming down to the ground station. 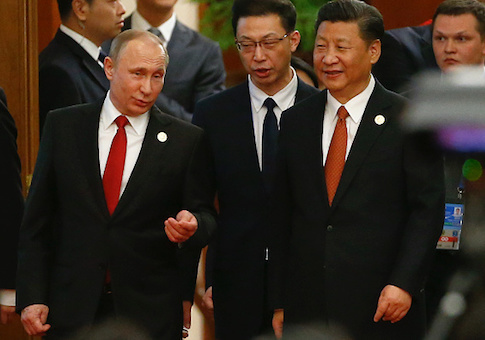 "China and Russia consider both offensive cyber capabilities and electronic warfare as key assets for maintaining military advantage," the report said. "As a result, both countries are researching and developing cyber capabilities and modernizing electronic warfare assets." China and Russia also are using ground- and space-based sensors to search the skies for foreign satellites. The sensors are "first in a sequence of steps that a potential adversary will use to target satellites, launch counterspace weapons, and assess the effectiveness of an attack," the report said. The space surveillance can also be used by militaries for denial and deception to hide sensitive military capabilities or ground operations. Monitoring space threats is difficult for U.S. intelligence because adversaries are using dual-use civilian-military space systems that can appear benign but have hidden military and warfighting systems, such as robotic-arm satellites. China has conducted tests of three small satellites including one with a robotic arm capable of grabbing nearby satellites. Russia also is testing small maneuvering satellites.